We do our best to make sure you never need to use this policy. We are dedicated at Paaneri.com to offer you the best quality in our products and our services. We know that mistakes are sometimes made and we are here to help remedy those problems. If you have received a damaged item or if the item you received was not the item you ordered or if it was misrepresented on our site, please contact us by email within 24 hours of your receipt of the product. It is important that you save all packing materials as well as the item itself. When you reach us, we'll give you instructions on how to proceed as quickly as possible. We do not take return or exchange once the order confirm. Always email us first if you have a problem on info@Paaneri.com Always be sure to report your problem within 24 hours of receiving the item. 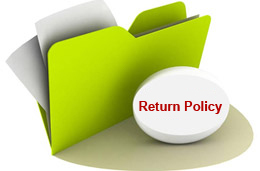 Always return your items using registered airmail / courier who provide proof of delivery. Please return within 7 working days of confirmation from our end, and with original packing & in original condition (please, no worn, washed, used or altered items). Please ensure to include a copy of the invoice you received. ( we require Price Tag of Barcode label) We will examine the garment you return, figure out what went wrong, and take immediate steps to prevent such problems from reoccurring. Sending back safely to us is your responsibility. If something happens in transit and the package doesn't get delivered to us, we cannot help you. So make sure to send thru reliable courier agency only and forward the tracking details to us and keep the airway bill till it gets delivered to us. Please mark the items as, defective return items and not for sale. We will do free alterations & modifications before delivering the goods to you. No refund can be issued under any circumstances. We will request the customer to ship back the item to us in India for alterations at their cost. Be extra alert when accepting parcel from courier. If the outer packing is damaged or tampered with, do verify the items quality and quantity before accepting the package from the courier agency. In case of any discrepancy, either refuse to accept delivery or accept delivery only after putting suitable remark on the proof of delivery. Also lodge proper complain with the local office of the courier agency, so that you may pursue them. While every endeavour has been made to accurately reproduce colors, there may be minor variations in color of the actual product because of the nature of fabric dyes, weather at the time of dying and differences in display output due to lighting and digital photography and color settings and capabilities of monitors. A customer must place an order keeping in mind this variation in color as seen on a computer screen against the actual color of the outfit received. PAANERI firmly believes that all the customers who order online are aware that colors seen on a monitor will be slightly different as compared to the actual outfits or accessories ordered. It is practically impossible for PAANERI to replicate the same colors on an outfit as seen on your monitor. A variation in the shade selected by you is considered as a normal practice as these garments have a tendency to reflect different shades of a color under different light and weather, type of camera used for photography or type and settings on the computer monitor. We wish to clarify and ascertain that every customer who orders any outfit from PAANERI is aware of this genuine problem. Red, maroon and orange colors have a higher tendency to reflect a different shade then other colors. For example even if you your self try to photograph from a digital camera or scan a red garment, in most of the cases it will show either as maroon or orange on the computer monitor. Though imaging technology has advanced, still no fool proof solution to this problem is available at the moment. Many a times green and blue also overlap. same is the case with off-white, white and cream colors. we believe that customers who are ordering items with sequence and other beaded embroidery are aware of the fact that these shiny embellishments have a tendency to come off. Even with the best of handling and care this cannot be avoided altogether. Many a times during strict physical checking at the customs during transit, more then usual sequences and beads come off. Many a times it may happen that you open a box and find some pieces falling down on the floor. Or you wear the dress and in a few hours you might loose some of them. Do not panic or over-react because if you look with a magnifying glass at any such dresses / sarees worn by others, you will most certainly find some pieces missing or almost at a state of falling down.